It is not often that a glass lifting machine will impress so much that people just stand and stare. But that is certainly the case with Winlet glazing robots. The little green machines are building a big reputation, and drawing admiring looks, wherever they are used to lift glass, or other non-porous sheet material. Questions like, ‘How do they actually do that?’ are not far from many people’s lips as they watch how the glazing robots lift and manipulate materials with ease. As Hird Group is Winlet’s authorised distributor in the UK and Ireland, it is of course our job promote these mighty glazing robots. But it is so much easier when the machines do such a good job of demonstrating their abilities during lift after lift on the worksite. So, why are our customers, and just about everyone who sees them, so impressed with Winlet glazing robots? 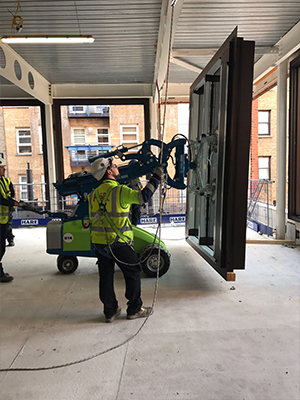 Why do they say the machines are a ‘gamechanger’, and ‘the biggest advance in glass lifting for a decade’? We think it comes down to 6 key attributes that set Winlet material lifting robots apart. Safe lifting is critical to any lifting project. The Winlet glazing robot’s dual circuit vacuum system ensures the load continues to be held on the machine’s vacuum cups even if there is a critical failure in the suction system. The machine has easy-to-use intuitive controls. It can also be operated remotely via a wired remote control pad, so the operator has the best view of the lift and the whole worksite. 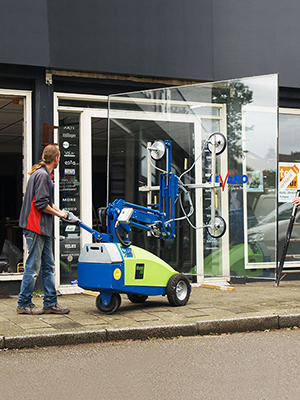 Firstly, for such compact glazing robots, Winlets have exceptional lifting capacity. The Winlet 1000 is 2070mm long and 870mm wide but can lift glass panels weighing up to 1 tonne. Secondly, the is an excellent and growing range of Winlet glazing robots, so a machine can be matched precisely with a lifting requirement. The Winlet 350, the baby of the fleet, can still lift loads of 350kg. 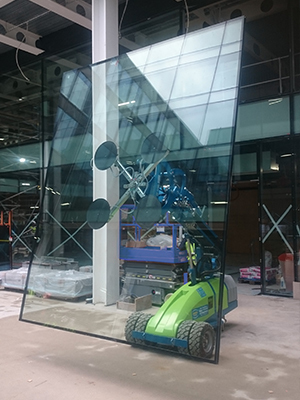 The bespoke glass manipulation system developed for Winlet glazing robots impresses our clients greatly. It allows the machine to hold a piece of glass in the same plane, no matter how it is moved, either up or down or side to side. 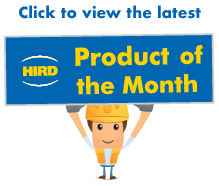 This allows glass to be places with absolute precision in an aperture with no manual handling, enhancing the speed, safety, and productivity of any installation project. Also, with the Winlet, the aperture could be directly overhead. 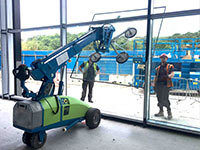 As has been mentioned, Winlet glazing robots are ideal for glass installation. They are also perfect for lifting and installing plasterboard, granite, metal sheeting and glass reinforced concrete sections. For the latter, Winlet has developed special vacuum cups to ensure materials with a slight grain can be held safely. Also pad extensions, developed by Hird and Winlet, allow the glazing robots to install mullioned windows. 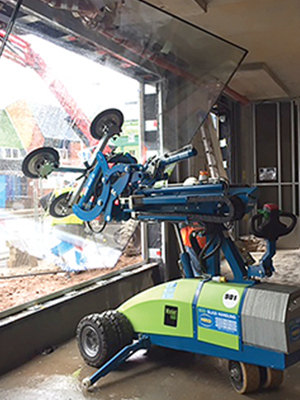 The compact size of Winlet glazing robots, and the impressive stability of the machines, contributes to excellent operational capability in confined spaces. Its ability to carry loads simplifies the lifting and installation process, reducing the need for manual handling and risk of load damage. Its vacuum manipulator allows inside-out installation, eliminating the need for expensive and obstructive external lifting systems. All these attributes contribute to what, we believe, is industry-leading productivity. In fact, our clients are reporting a doubling of productivity compared with some lifting methodologies. The number of operatives needed for panel installation is reduced from up to five to no more than two. 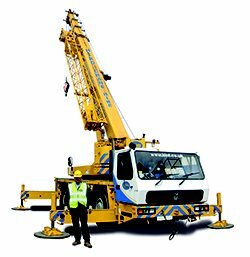 The machines can be used independent of other lifting systems, such as tower or mobile cranes, so do not impact on other worksite tasks. 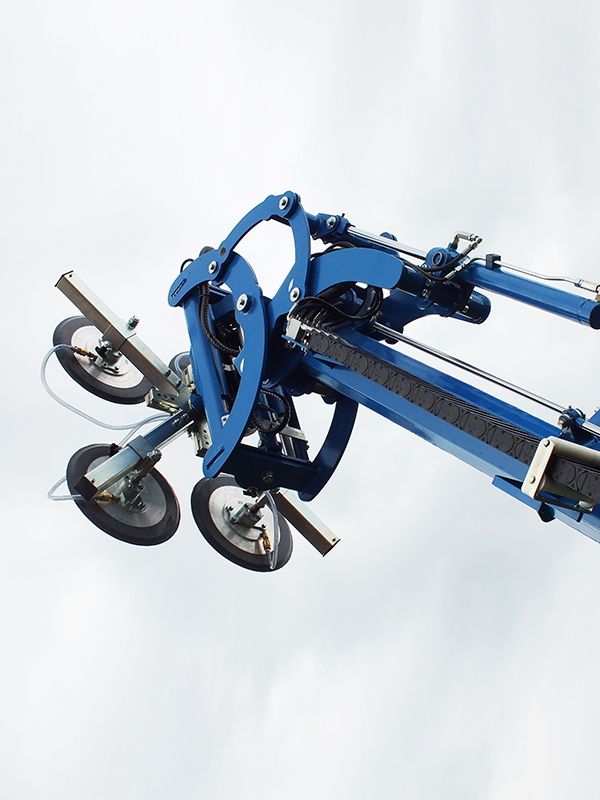 Winlet is one of the most innovative lifting companies in the market right now. It is continuously developing new machines and enhancing the capability of glazing robots across the range. 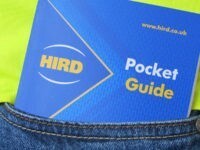 Hird is very pleased to be able to support the manufacturer by sharing our expertise, as well as feedback from our growing list of Winlet users. 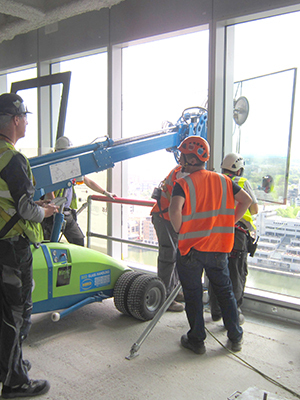 Call us today to find out how Winlet glazing robots can enhance material lifting during your installation projects. There are (at least) six reasons we believe you will enjoy the experience. 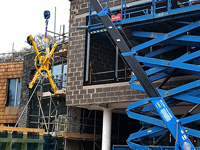 Hird also has comprehensive services for pick and carry crane hire, spider crane hire, vacuum lifter hire, and can offer a full range of accredited mini crane and glazing robot operator training.